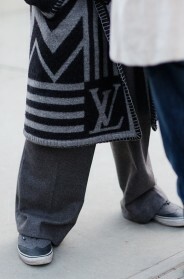 So much fashion action around the waist and on men’s pants right now. I really like this British style belt-less pants. They are perfect for the summer. This stylish chap has the best barber…a perfect 10 haircut and beard trim…those trousers are sublime…the stitching on the zipper is almost couture! Only a dude who looks like that could pull off this look. But hey, more power to him. In love with this outfit and the whole look! Wow! Tonal-with-a-vengeance. Almost military -like in the precision. Im a bit more louche in my presentation, but I respect and admire the work that went into this. 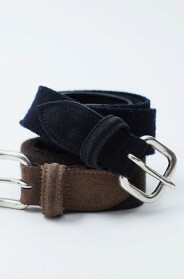 I remember when belt-less pants were the predominant fashion quite a few years ago. It will be interesting to see how a new generation interprets it. Good to have you folks back. I’ve missed you! italian special forces looked like that when armani designed their uniforms in the 1970ties. 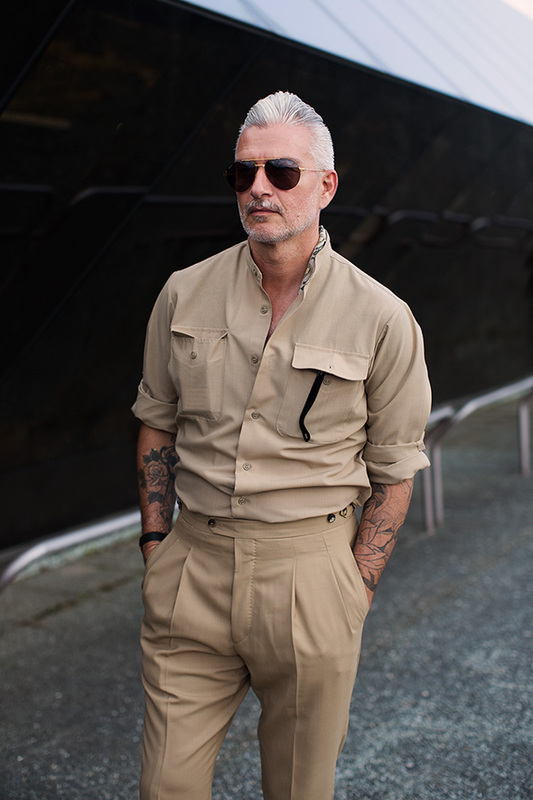 What is so striking about this look is that it revolves around neutrals and simple lines: oddly enough, rather than detracting, his tattoos bring out the best of this very stylish man. But then again, he certainly has the physique du rôle. I love the detailing on the inside of the collar. Hurray! I bought a vintage Gucci (circa Tom) matching khaki shirt and skirt. While I was drawn to the idea, I wondered was it too much and too military (even though khaki and summer are the perfect match!). This has me convinced! Amen to that. You must have room in your pockets to fiddle with your keys as you rock on your heels. Proper trousers for proper men — like your old geography master at school. The low slung hipster trousers are bloody uncomfortable. A second amen…..trousers for grown men…..
Looks like PT (pantalone torino) pants? its perfect dress for man i like the hole dress..
Love the sunglasses in the pocket! nice jackets and glass, looking dashing. this is perfect dress for men, very stylish yet contemporary! Really awesome style for gentle look! Very nice sharing this blog for more informative and useful. Thank you. Awesome dress look for men. I am also like a British style. Hi, I am Ipsita. I am very happy to read your article. Your article is very good. This article is an important information for me. If you have some time please read my article and suggest me how can I improve my article. And thank you for priceless information. Ooh, this one, love the silver hair, earth-tone matching shirt. and the glasses. perfect for a warm day out.